With a brutally cold and snowy winter pounding the eastern half of the country, demand for fat bikes has skyrocketed. This dramatic rise in interest was evident at the North American Handmade Bike Show with an array of builders showing their latest fat creations. 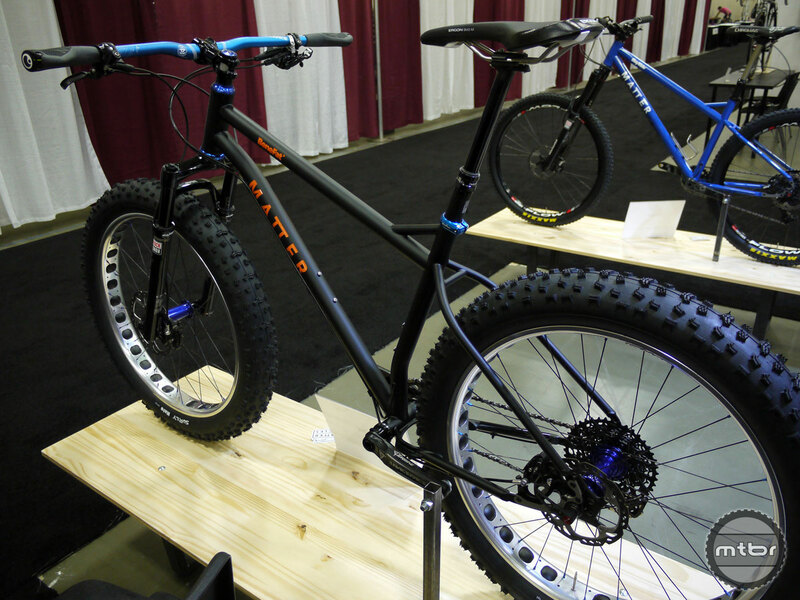 Even the weather in Louisville, Kentucky (locale of NAHBS 2015) was in on the fat bike theme, with a snowstorm hitting the city and shutting down much of downtown on the Thursday before the show. Despite the cold and snow, attendees of all ages still turned out en masse and many flocked to the abundance of fat bikes displayed on nearly every aisle. Boo Bicycles‘ vibrant blue and white polka dot fat bike with rims painted to match was hard to miss. This Aluboo model was one of the less expensive frame constructions offered by the bamboo bicycle manufacturer. 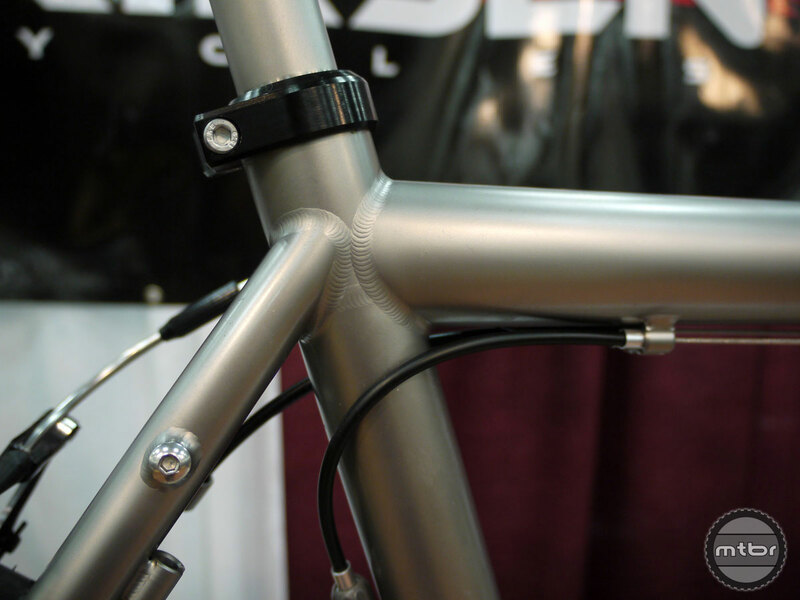 Aluminum lugs and bamboo tubing are epoxied together to create a durable frame for a reasonable price. 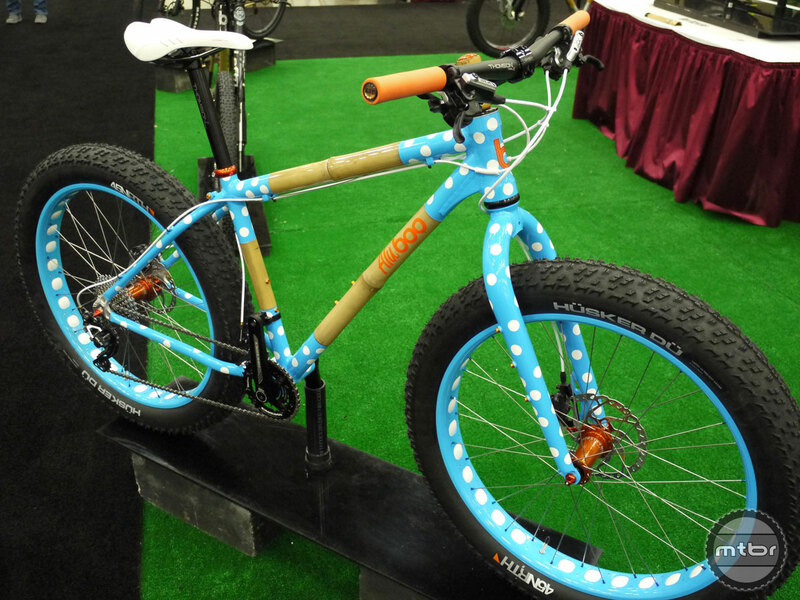 Starting at $900 (frame only), the Aluboo was one of most affordable bikes at the show this year. 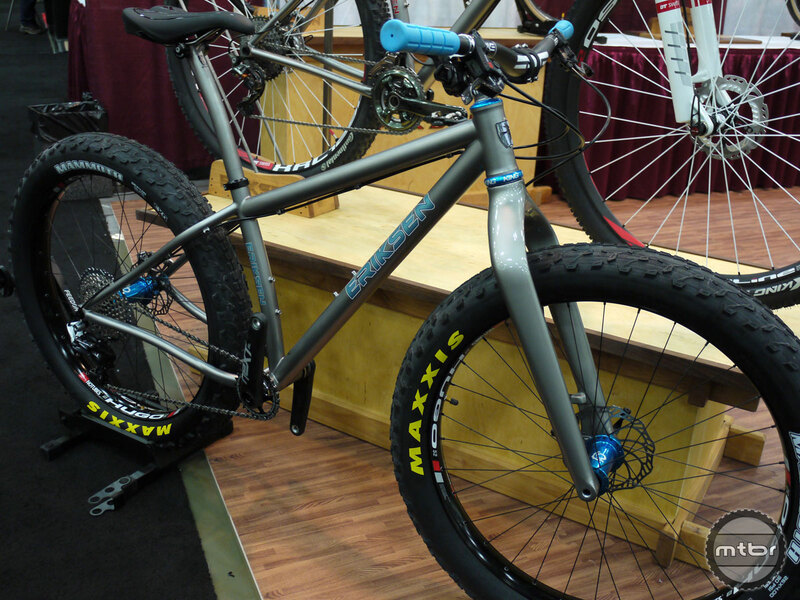 This not-so-fat titanium fat bike from Eriksen weighs in at just 23 pounds. Known for immaculate TIG welds, Eriksen’s precision was evident from top to bottom on this fat bike. Eriksen’s welds were some of the best seen all weekend and the NAHBS judges awarded the company Best TIG Weld for one of its other similarly flawless bikes. Builder Collin Schaafsma of Matter Cycles built his BeneFat fat bike so that it can be ridden all year round. The bike was designed with aggressive geometry to help it feel like a trail bike on or off the snow. For powdery snowy days however, the BeneFat that is pictured here with 3.8″ tires can also fit up to 5 inches of rubber while still maintaining a lively feel, says the builder.